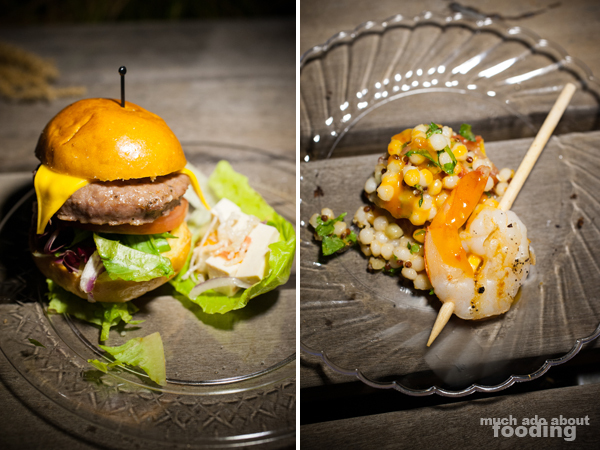 Duc and I attended a tasty event last night, the biggest event of the year for Riviera Magazine Orange County that is. 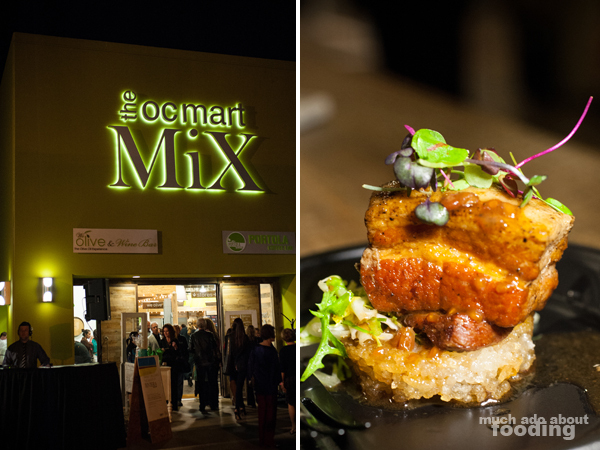 The "To Live & Dine" Chef's Challenge event was held this year on the cool fall night of November 1 at the OC Mart Mix in Costa Mesa. 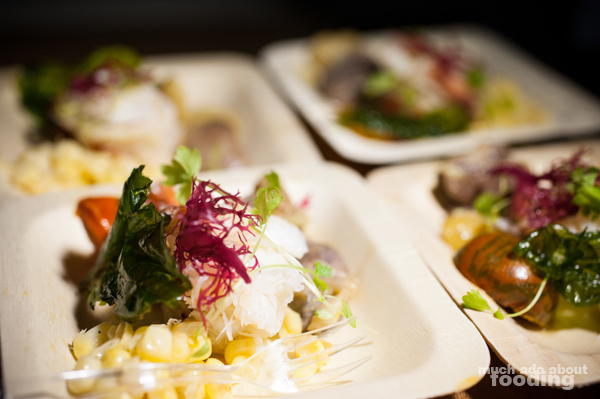 22 chefs "competed" for the crowd's choice by providing tasting plates of a dish - guests were given one gold voting coin at registration to place into their choice chef's voting jar. 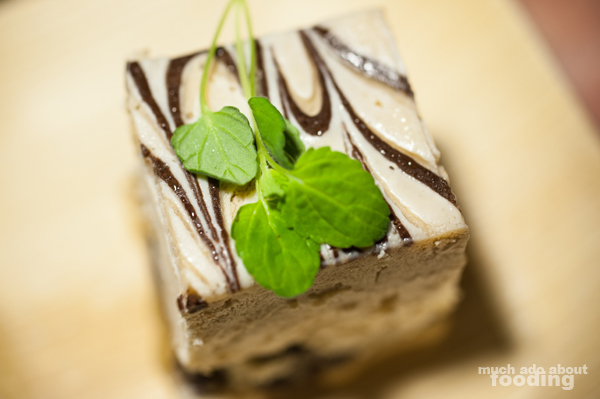 Pictured above was Mesa's plate, a marinated pork belly atop a crispy rice cake and topped with microgreens. Below are the other eats for the night in alphabetical order. 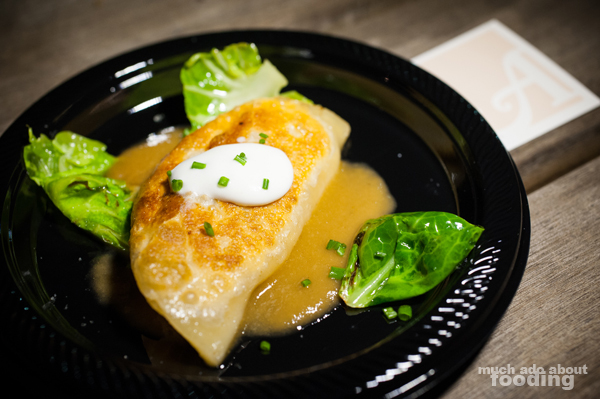 "A" Restaurant of Newport Beach gave out their pierogi filled with chorizo, four-year aged Cheddar cheese, and potato; their mixologist was also on-site but I didn't get a chance to try their concoctions. Bistango of Irvine had a variety of offerings. 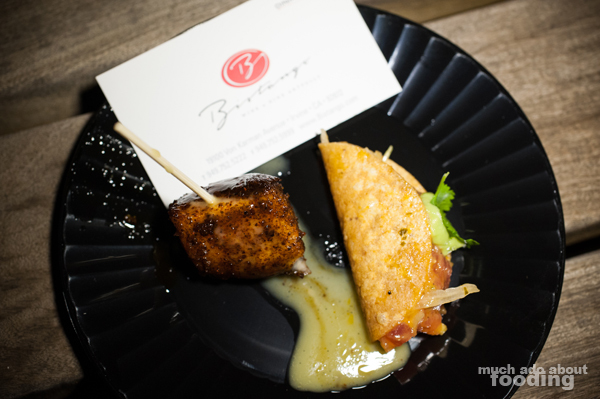 They gave a crab and lobster cake (served with roasted tomato-peppers relish, pea sprouts, and lemon vinaigrette), yellow fin tuna tartare tacos (with chile vinaigrette, julienne cabbage, and avocado crema), and a spicy caramelized salmon lollipop coated in a vanilla bean vinaigrette. Cinepolis of Laguna Niguel had a slider, tofu lettuce wrap, and grilled shrimp skewer atop a spicy Israeli couscous base. We didn't get a chance to try out Cucina Alessa of Newport Beach due to the lines but it was just one of a handful unable to be reached. 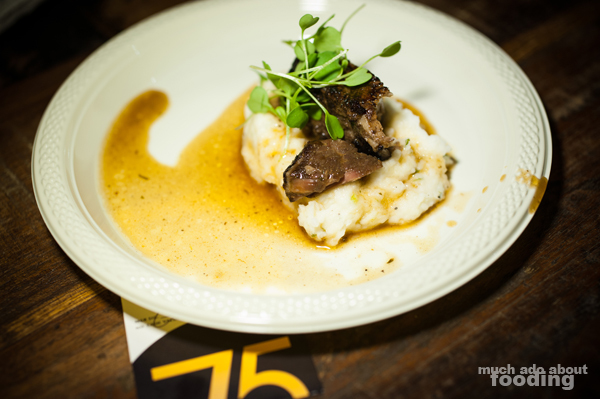 French 75 of Newport Beach brought a three-day braised short rib atop hickory-smoked mashed potatoes. 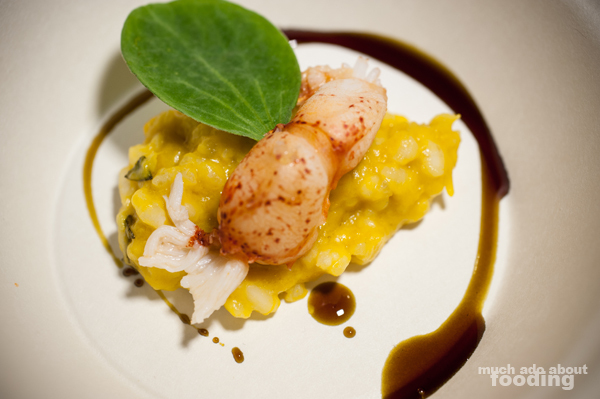 Haven Gastropub of Pasadena and Orange featured a butter-poached lobster on pumpkin risotto, chestnut butter, and petite pumpkin greens. 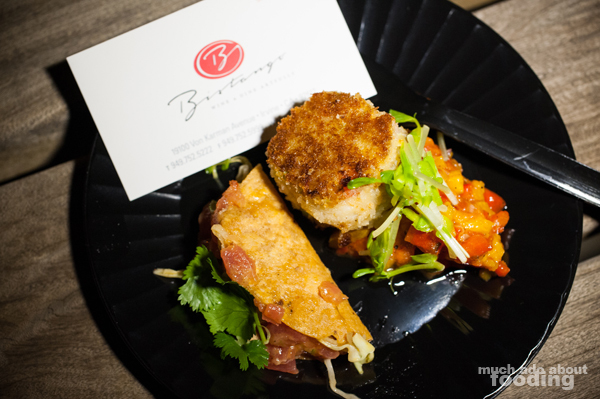 ...du bois ran out before we could get to them, and we didn't get anything from Mare Culinary Lounge of Laguna Beach. 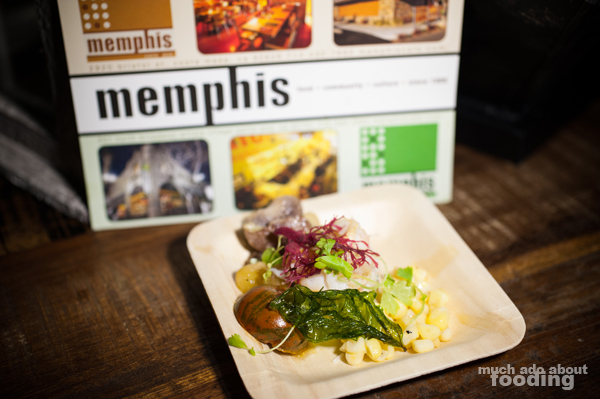 Memphis of Santa Ana had out their summer succotash, a medley of christmas lima beans, dungenness crab, red ogo, and smoked olive oil on corn. 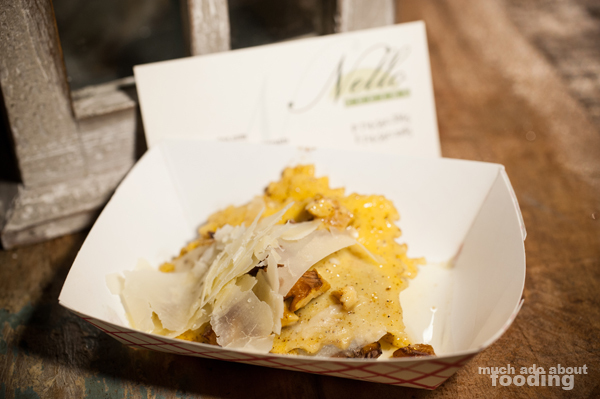 Next up are Nello Cucina of Costa Mesa who welcomed everyone with some chicken porcini ravioli tossed with black truffle oil, toasted walnuts, and freshly shaved Parmesan cheese. 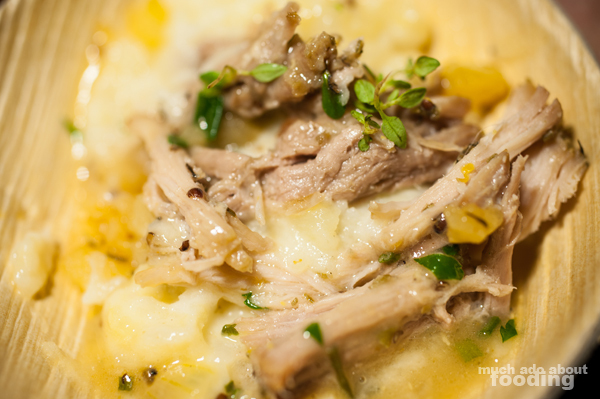 Nirvana Grille of Laguna Beach brought two different punches to the game with their braised duroc pulled pork medallion (with root vegetable puree, roasted thyme Fuji apples, grain mustard, shallot, parsley, and a pork demi glace) and their cashew almond salted caramel pie (lecuma crust, pink salted caramel, organic coconut, cashew, almond milk custard, and raw cocoa chocolate. 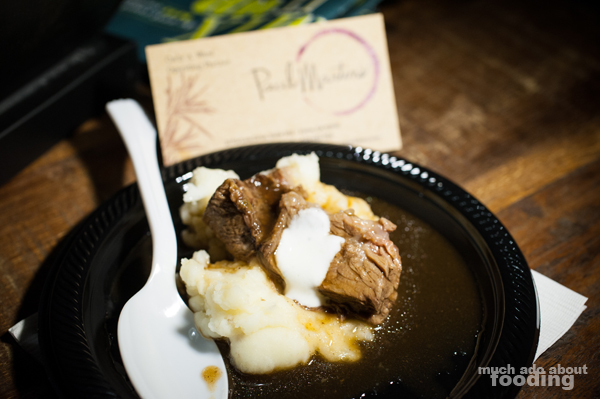 Paul Martin's American Bistro of Irvine had a three-hour braised short rib with mashed potatoes, horseradish cream, and beef jus. 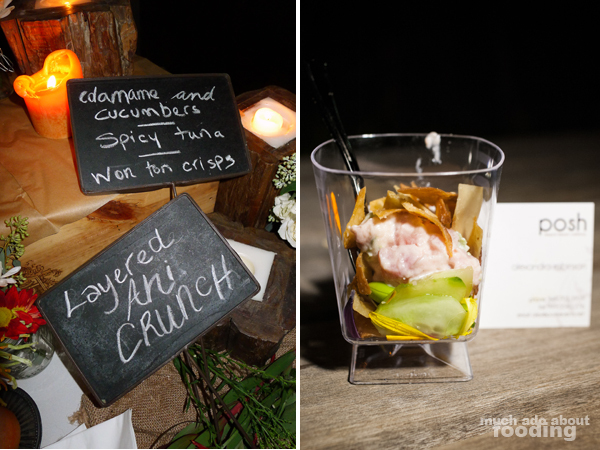 Posh Events of Newport Beach had their layered ahi crunch of edamame, cucumbers, spicy tuna, and wonton crisps. 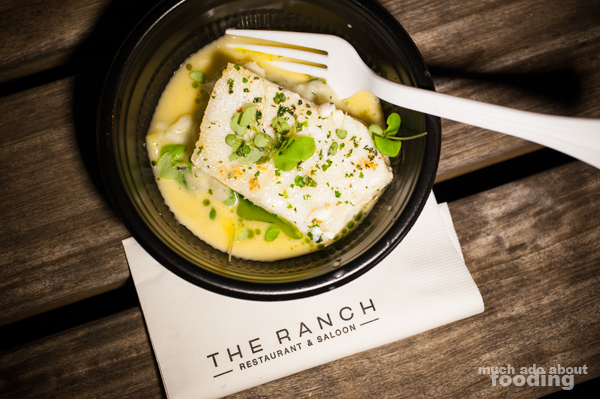 The Ranch Restaurant & Saloon of Anaheim had their Chilean sea bass atop lobster risotto and Meyer lemon nage with a shooter of pumpkin pie pudding layered with poached cranberries, chocolate soil, and spiced cream. Their mixologist was also there serving drinks - the Smoking Gun Martini (Tanqueray gin, Italian bitter aperitif, muddled fig, yuzu citrus, strawberry & mint sprigs, and a balsamic reduction glaze) and the Watermelon Crawl (Ketel One vodka, elderflower liquer, lime juice, yuzu citrus foam, fresh watermelon and cucumber, and pickled watermelon). 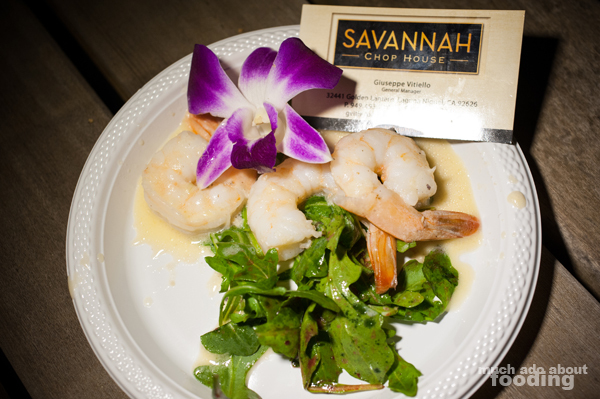 We missed Roy's Hawaiian Fusion Cuisine of Anaheim unfortunately but did manage to get some big eats from the lively bunch at Savannah Chop House of Laguna Niguel who were serving up a tequila shrimp with greens. 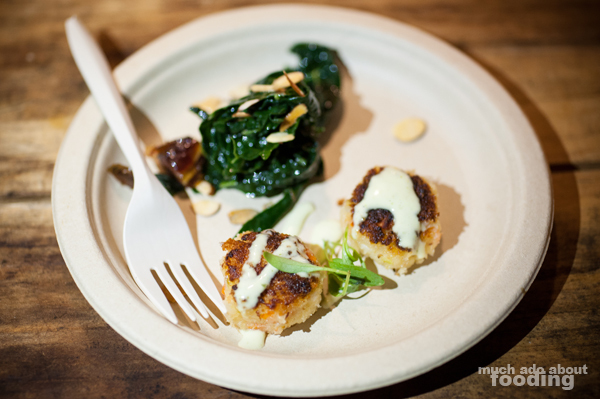 Scott's Seafood of Costa Mesa served up mini shrimp cakes with kale emulsion, microgreens, and kale. 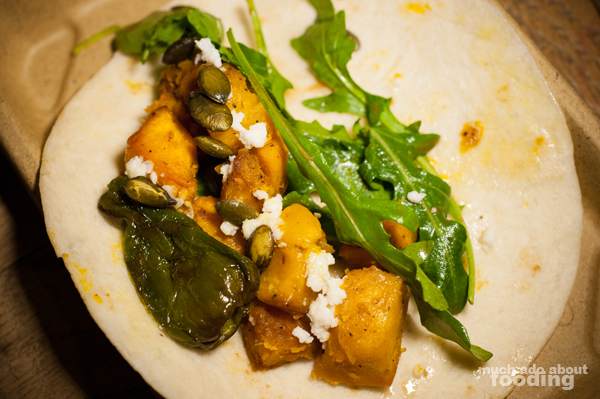 Taco Asylum in the same city featured a pumpkin taco of roasted sugar pumpkin, wild arugula, padron peppers, pepita seeds, queso fresco, and an orange-balsamic vinaigrette. 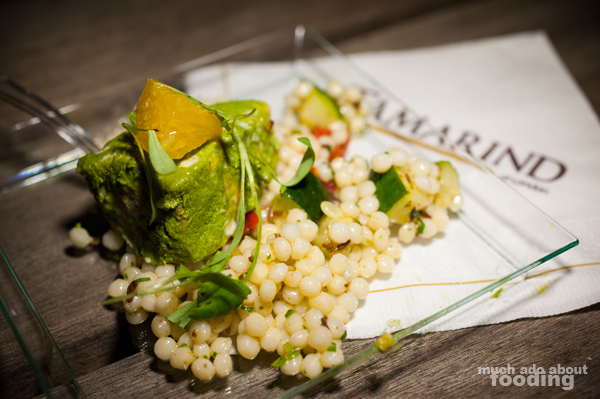 Tamarind of London in Newport Beach had a lime tandoor salmon alongside Israeli couscous. 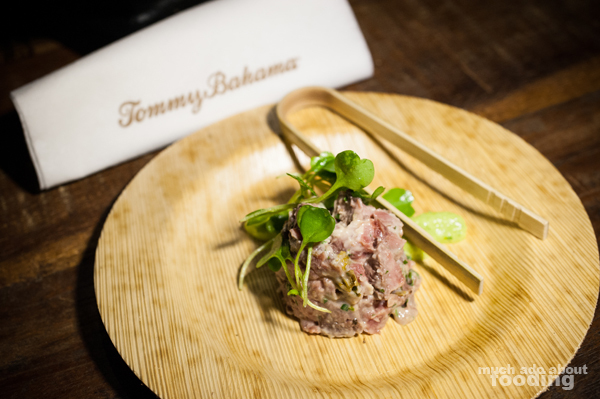 Tommy Bahama Grille of the same city had their spin on a tartare with seared raw beef mixed with wasabi and accompanied by edamame hummus. 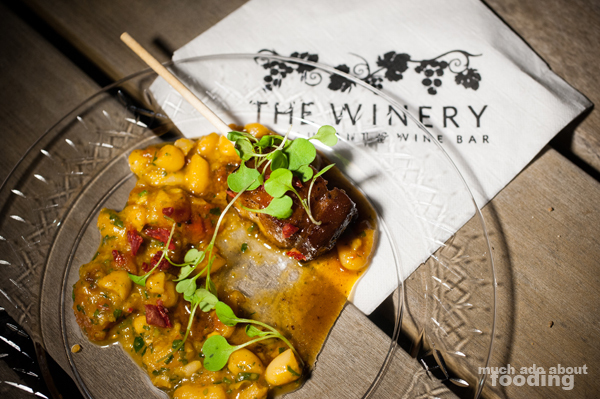 Lastly, the Winery Restaurant of Tustin had a crispy Kurobuta pork belly lollipops with cannellini bean and heirloom tomato compote, and wasabi, yuzu and toasted sesame seeds reduction!. 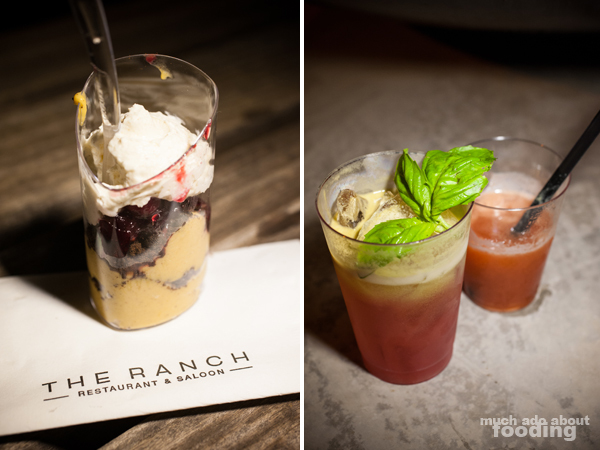 Congratulations to The Ranch for winning the people's choice that night! Additionally, the event's opportunity drawing proceeds went to benefit The Dream Gala of JDRF Orange County Chapter so I hope much was raised. Cheers to all the people I saw again and to all the participating chefs!